Why do we keep putting it back on our backs? Moving far beyond the weight we've lost, I wonder why it is that we keep getting rid of unnecessary burdens and then putting them on our backs again. Isn't it time we set them aside for good? 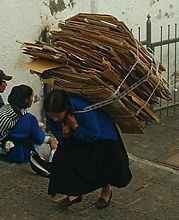 What unnecessary burdens are you carrying? You can't miss the headlines: "One in four adults is overweight or clinically obese," "Overweight youth more likely to watch more TV," "More than a billion adults overweight worldwide," and this one that caught my eye, "Overweight people now outnumber hungry people." In my lifetime, dieting has become a national obsession. We have scores of options to choose from. I bet you could name most of the top 10 off the top of your head. If the diets don't work we have surgical options: Gastric Bypass or Gastric Band (Lap-Band®). Regardless of the options available or how much we have lost in the past, most of us continue to carry around too many extra pounds. And, in the long run we suffer the consequences. Those extra pounds of fat we have accumulated are not the only things that weigh us down. There is another weight we carry that is below the surface, hidden in the corners of our memories. We call them burdens, regrets, worries, grudges, and resentments that have been covered and carried for years. There is no diet for these extra pounds, but there is a radical surgery available. It requires a spiritual scalpel. Come to me, all you who are weary and burdened, and I will give you rest. Take my yoke upon you and learn from me, for I am gentle and humble in heart, and you will find rest for your souls. For my yoke is easy and my burden is light (Matthew 11:28-30 NIV). Jesus takes the burdens, the weights that become slavery to us, so why do we continue to carry them around? Faith says, "We are free," but just like we do with weight-loss, we have a tendency to reclaim what we've lost. There is something wrong with faith that picks the burden back up and ends up being buried by it. Give it up, lose it for good! After fifty-eight years of life, Bill was living his last days in hospice care. His cancer had reached an untreatable level, and even though the doctors were able to help his pain, he was still having a difficult time. Bill's body was rebelling, robbing him of the blessing of dying peacefully. Something inside him was keeping him alive. The chaplain took the son aside and explained. "The doctors are doing everything they can to ease your dad's pain. But, I believe your dad has some unfinished business, some long hidden burden that is keeping him alive. Are you aware of any problem in the past that could be bothering him?" "Yes, I know what's wrong," replied the son. "I am not my father's only child. A number of years ago when my sister was in high school, she decided to get married. She had fallen in love with a boy of a different race and when she announced her intentions to marry, my dad hit the roof. He told her that if she married that guy, she'd never be welcome in the house again. She would be disowned. My sister married the guy and my dad kept his word. Even though she lives less than an hour away, he never talked of her again." Her only response was, "I know!" "If you know how to contact her, get her here as soon as possible," the chaplain requested. Later that evening, the young woman who had been disowned thirteen years earlier nervously waited in the lobby. Beside her was young Billy, a four-year-old grandson Bill had never seen. After the chaplain explained Bill's condition, the four of them--the chaplain and Bill's son, daughter and grandson--entered Bill's room together. Although Bill was confined to the bed by tubes and wires, he was alert enough to recognize his daughter. She was his burden, his unfinished business. When she reached the bedside he looked up at her with tears in his eye and said in a gentle, hopeful whisper, "I'm so sorry, I love you!" With tears all around, they hugged as though they would never hug again. For hours that night, they talked about old times, catching up on life, and soaking in the moment. They took pictures, lots of them. Then with everyone gathered around, Bill turned to his son and said, "Thank you for bringing her back." To his daughter he said, "Thank you for coming." To his grandson, he said, "You're going to be a good daddy someday." With his final breath, Bill whispered, "I love you all!" and died. Bill missed years of good times because he wouldn't do what was necessary to turn loose of the past. He robed himself of the greatest joys of life. Don't make that same mistake. Do it now! Lose it for good. Jesus has blessed you with a "yoke of grace." Do whatever is necessary to turn loose of the regret, the resentment, the grudge, the doubt. Do it now. Please, do it now! "Lose It for Good!" by Ron Rose is licensed under a Creative Commons License. Heartlight encourages you to share this material with others in church bulletins, personal emails, and other non-commercial uses. Please see our Usage Guidelines for more information.